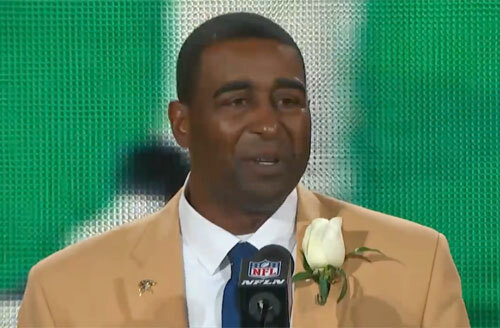 Cris Carter is considered one of the most accomplished pass catchers in NFL history. Drafted out of Ohio State University by the Philadelphia Eagles in 1987, Cris’s first reception as a pro was a 22-yard touchdown catch. He went on to a stellar NFL career spanning 15 years, including 12 years with the Minnesota Vikings. Cris played a full 16-game slate for 13 seasons and appeared in eight consecutive Pro Bowls. In 1999, he became only the second player in NFL history to catch 1,000 passes, putting him into the history books alongside Jerry Rice. Cris ranks second on the NFL’s all-time list for total receptions (1,101) and receiving touchdowns (130). He was named to the All-Decade Team (1990) by the Pro-Football-Hall-of-Fame Selection Committee and received the 1999 NFL Man of the Year award. arter was voted to the Pro Football Hall of Fame on February 2, 2013. PFP Sports & Celebrity Talent Agency is a top booking agent for motivational sports speakers and celebrities. If you would like to book NFL stars like Cris Carter for a speaking engagement, personal appearance or special event, you can request Cris Carter agent and speaker information from PFP Sports & Celebrity Talent or call 800.966.1380.